Summer is a great time for water, swimming and pools. Here are some ideas to integrate it into your lesson plans. Decorate your classroom with a pool theme. Find some inflatable tubes and hang them at different places in your classroom. Beach balls too are great for decorating. Get pictures of all the kids in their swimwear and put them on your bulletin board. Get kids to draw pictures of the pool and swimming at the pool and use them to decorate your classroom. Decorate different containers in blue to make “pools." Find small plastic figures, or cut out dolls from cardboard to make children. Write a number on each “pool." The children have to place the correct number of children in the pool. Make a set of inflatable tubes by cutting out rings on cardboard or thick card stock. Decorate them with different colors and designs. Make sure two look exactly the same. The children have to find the matching tubes. Cut out circles on cardboard and make beach balls of different sizes. The children have to place the balls in order of size. Make large sized pieces to make this a group activity. Find stories and books related to the pool, swimming, and water that you can read with the kids. Label your pool decorations with neatly printed words. This will help children get familiar with the words. Get children to make drawings of the pool and label their drawings. Take the children for a field visit to the pool to learn and play. Use the pool to teach children how some things float and some things do not. Help children understand how moving our arms and legs helps us to swim. 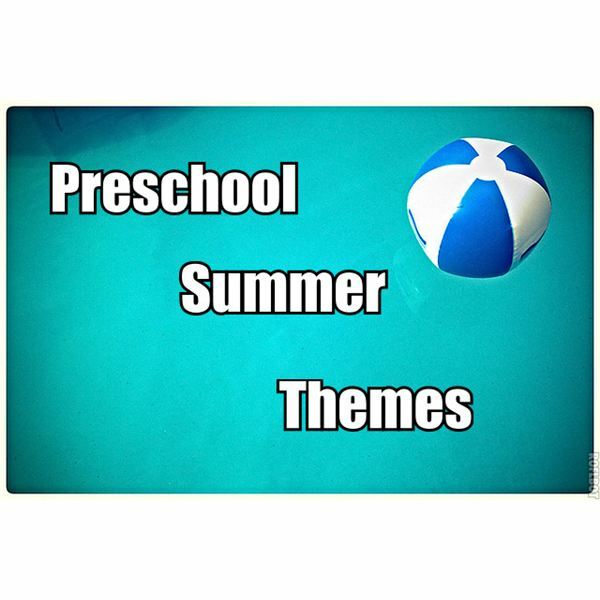 A list of summer preschool themes won’t be complete without a beach theme. Bring holiday fun and excitement with these beach theme ideas. Decorate your classroom with beach umbrellas, sea creatures, beach balls and pictures of life at the beach. If possible, make your own “beach" in one corner of the classroom using blue scarves for the sea, sand for the beach and dolls or other toys to show life at the beach. Make lifeguards by printing out pictures from the internet, gluing them on cardboard and cutting them out. Write out numbers from 1 to 10 on the front of every lifeguard. The children have to place the lifeguards in order. Teach children patterning with this simple activity. Draw towels on cardboard and cut them out. Color them with two different colors. Start a pattern for the child, for example two red, one blue, two red, one blue. Ask the child to continue the pattern. On the board write out “2 fish" followed by a picture of a fish, “3 umbrellas" followed by a picture of an umbrella “5 children" followed by a picture of a child and “1 ball" followed by a picture of a ball. The children have to draw a picture of the beach and draw fish, umbrellas, children and a ball according to the number you have given. Use a picture of a beach and play a game where the children name all the things shown on the picture that start with “B." Play sand alphabets where children get sand in a tray or a flat bowl and write alphabets on them with their fingers as you call them out. Teach children about sand and water. Discuss how sand heats up faster and loses heat faster. Use this as an opportunity to teach children about why we should not litter the beach. Teach children about fresh water and salt water. Discuss how different kinds of fish live in different waters. The garden is full of life in the summer. Use this opportunity to help children understand more about plants, birds and all kinds of life seen in the garden. Bring the garden to the class. Keep a few plants that the children will be responsible for watering. You can also keep tadpoles or caterpillars. Make flowers with a picture of a child in the center and use it to decorate a wall or a board. Teach the children to make paper flowers and use them to decorate your classroom. Give children a picture of a garden and ask them to count the number of trees, flowers, birds etc. on the picture and write it down. Ask the children to get an assortment of sticks and help them sort it out into bundles of similar sizes. Then they can count the number of sticks in each bundle, tie them together and label them. Play a game where you call out a number and an object and the children have to go to the garden and get the right number of objects. For example four sticks, three rocks, two leaves etc. Write out words like flower, rock, stick, leaf and tree on strips of paper. Go to the garden with the children and label them. Get the children to act out a garden-based story in the garden itself. Help children learn about plants and all the things plants need to live. Ask children to make a scrapbook of leaves and help them to understand more about the huge variety of plants we have around us. Teach children about the various life stages of a plant. Use this garden theme to teach children about insects, birds, caterpillars and eggs. This is just a few ideas to get you started on these summer preschool themes. Be creative and have fun thinking of more ideas.